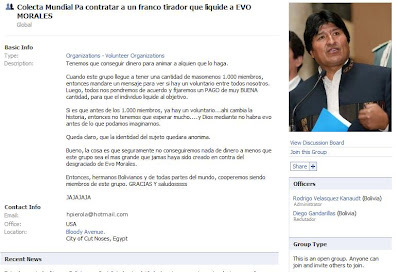 "World Collection to Contract a Sharpshooter to Liquidate Evo Morales"
"We have to raise the money to get someone to do it. When this group gets to the quantity of more or less 1,000 people, I will then send a message to find out if there is a volunteer amongst all of us. Then we all agree to fix a good price so that the individual liquidates the subject..."
Or maybe you'd prefer to pass his personal details on to the Bolivian authorities. After all, the Constitution now enshrines the country as a pacifist state. I think it wouldn't be a bad idea for somebody with a uniform to pop round to Hony's shack and have a quiet word with him, don't you? Thank you MG for passing this one on.